The Volkswagen Crafter is built on the same platform as the Mercedes Sprinter and shares a lot of common elements with its conational sibling. 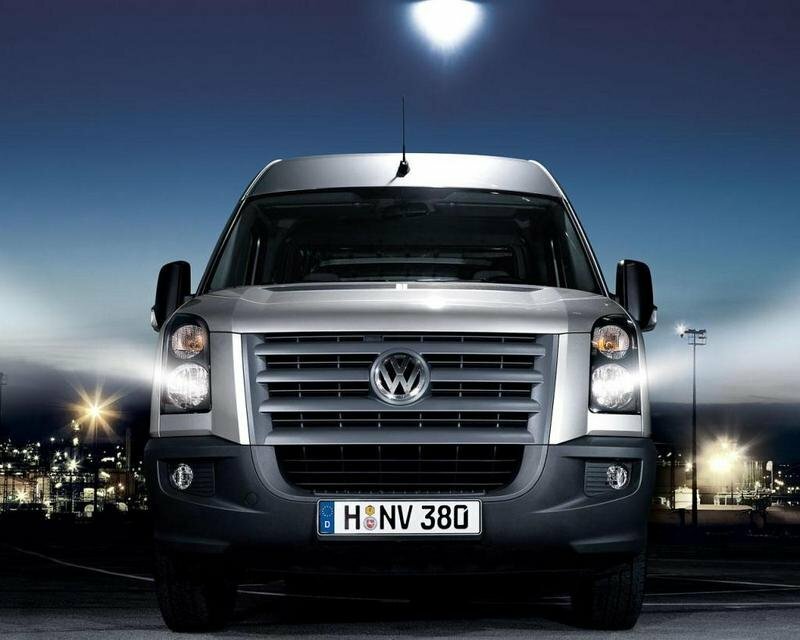 The Volkswagen Crafter, was introduced in 2006, and was designed for the 3 to 5 tonne segment. 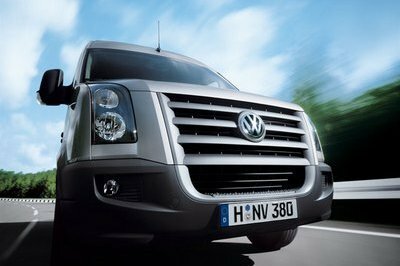 Basically, the Crafter is the third generation of the Volkswagen LT truck, which was around since 1975. There are three wheelbases available from 3.25m to 4.33m, three roof heights (low, high and extra high) and four body lengths, from 5.24m to 7.34m. 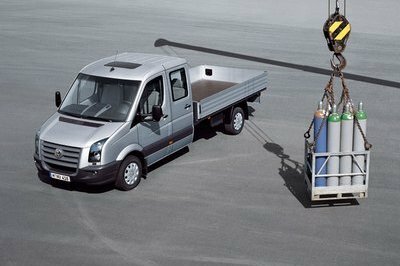 And, with a load space that ranges from 7.5m3 to 17m3 the Crafter is capable of carrying payloads of up to 2,693kg. The Volkswagen Crafter is also available in both Single- and Crew-cab configurations and has a starting price of $36.000. The overall design of the Volkswagen Crafter is very similar with the one of the Mercedes Sprinter. The vehicle features the same cabin shape and except for the radiator grille, headlights and spoilers everything is identical with the Sprinter. 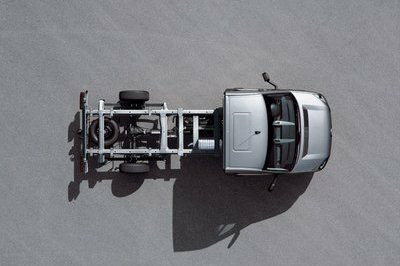 However, unlike the Mercedes model which has a more elegant design approach, the Volkswagen Crafter Chassis Cab features a more purposeful stance which underlines its rugged character. Underlining the utilitarian nature of the truck, the rectangular radiator grille is traversed by three horizontal bars, while the Volkswagen logo sits in its center. The vertical headlights look pretty close to those from the Ford Transit model and gel well with the black bumper which features a massive air intake flanked by two circular fog lamps. Unsurprisingly, the interior is also identical with the Sprinter and the only detail that lets you know that you are sitting in a Volkswagen is the “W” logo mounted in the center of the steering wheel. The plastics and materials are at least a class over most of the other vehicles in the segment and the cabin offers plenty of space with acres of headroom. We also like the instrument cluster as it features a pretty modern design with two round main gauges and a central rectangular display with useful information about the vehicle. The standard seats however don’t offer a good side support and after a few miles they start to feel a bit uncomfortable. On the other hand, the superior trim levels offer better seats with an enhanced lumbar support which are fairly comfortable even for the long journeys. The seats have also a wide range of adjustments, while the multifunctional steering wheel is available with reach and rake adjustments allowing you to find a good driving position. The high seating position gives you an excellent view of the road, while the plate sized heated door mirrors are also up to the task. As any respectable commercial vehicle, the Volkswagen Crafter is also fitted with plenty of storage places which include five drink holders, document holders on the centre console, glove compartments, overhead storage, door pockets and a storage tray on the dashboard. The list of standard features isn’t too great and the most significant equipments are the power front windows, AM/FM radio, remote central locking and the air conditioning system. In Europe, the Volkswagen Crafter Chassis Cab is powered by a range of 2.0-litre Euro 5 TDI engines which were tweaked to be more efficient than the previous units. Moreover, enough, the Crafter’s compact, lighter engines mean payload is increased by up to 100kg compared to the previous models. The power outputs range from 109hp to 163hp while Volkswagen’s efficient turbo-diesel system and common-rail fuel injection ensure high performance and impressive torque, with reduced engine noise. Compared to the Mercedes Sprinter however, the Crafter engines feel more sluggish and have lower acceleration figures. 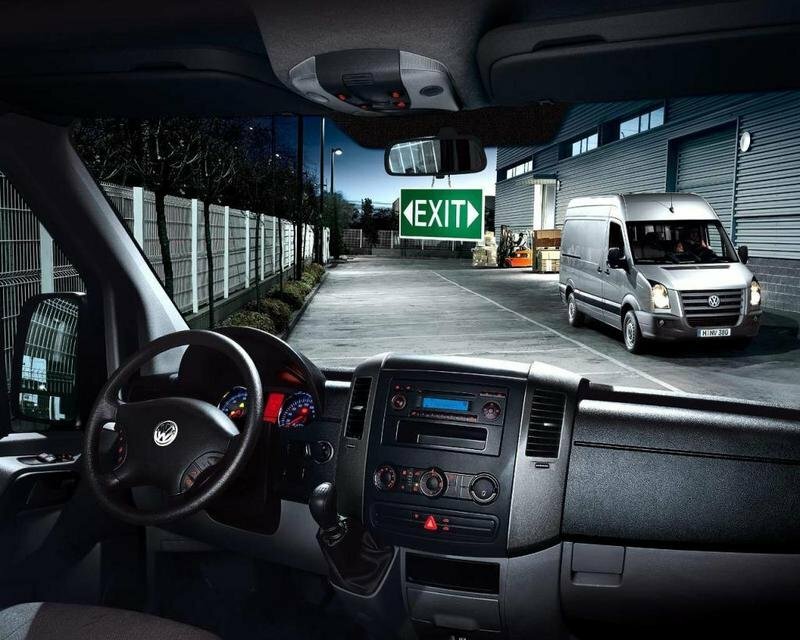 The Volkswagen Crafter Chassis Cab is also fitted with a Start/Stop system which helps to keep the fuel costs down, and keep emissions as low as 199g/km. This optional feature switches the engine off after a two-second idle. When you’re ready to move off again, all you need to do is just depress the clutch to restart the engine automatically. Simple yet effective, particularly if you tackle congested city streets on a daily basis. The Volkswagen Crafter if fitted with front and rear anti-roll bars, front transverse leaf spring independent suspensions and rear rigid axle with leaf springs and telescopic shock absorbers. Thanks to this configuration the ride is among the best in the segment and the suspensions can absorb the potholes without too much drama offering a relaxing cruise. The power steering is also among the best in the business as is responsive and offers a good road feedback letting you know exactly where the wheels are planning to go. The stopping power is assured by a hydraulic brake system with front ventilated and rear solid disc brakes. Besides the standard brakes there are also a host of other safety systems ready to keep you safe. Among them we name the anti-lock brakes (ABS), the skid-reducing Electronic Stability Programme (ESP) and the Traction Control System (TCS). The good part is that all come as standard. Moreover, if you make an emergency stop, your brake lights will flash while your hazard warning lights switch on automatically when you come to a standstill. The steel bulkhead will help protect you from what you’re carrying in the back, and the driver’s airbag from whatever’s in front. The Volkswagen Crafter isn’t quite as good as the Mercedes Sprinter, but it’s not far behind either. The overall design and the build quality is the same as its sibling, but the engines are less lively and don’t have the same refinement as the ones form Mercedes. Other than that, the Volkswagen Crafter is a versatile commercial vehicle that can deal with many missions without thinking twice. Its main disadvantage however, remains the acquisition price which is a bit peppered when compared with other trucks in the segment.